Portland’s Distillery scene is expanding and exploding. A recent article about local distilling pegged the number of distilleries at just over 27 between Forest Grove and Troutdale. This is a staggering number and even more so when you consider that I can think of at least 1 they missed. In the state of Oregon at large there are 35+ that fall under craft distilling and likely several more that aren’t on the radar beyond a street sign. In my original Post I outlined some basic stops for a good distillery crawl. Since then at least 2 new locations have opened on distillery row and some new west side locations have become worth the trip out to the suburbs. There are two outliers on the Distillery row. 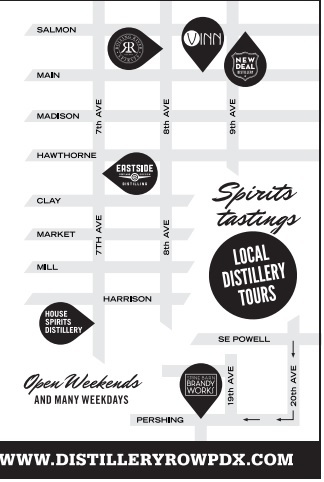 Wild Roots distilling is on NE 6th and Couch, this is easily 15 blocks from the next stop on the row. Stone Barn Brandy works is on SE 19th and Sandy, 24 blocks from their next most southerly neighbor. While Wild roots is new they have only two products listed, Stone Barn however has over a dozen at various times and is well worth the trip. If you have to cut one or the other out for time I would suggest starting at stone barn and then parking near House Spirits and walking the rest of the row. Some new eateries have sprung up in the last few years as well. Next door to Bunk Bar is the Boke Bowl a relatively new asian food place that has some wonderful noodles, steam buns and drinks. On 12th and Hawthorne is one of the best food truck pods in Portland. Despite recent shakeups and the threat of their lot being turned into mixed use apartments they have endured and signed a new lease, visit now for crepes, mexican food, whiffy pies and BBQ. Plus across the street is Lardo. Around the corner from Stone Barn is 50 Licks Ice cream where you can get a taste of Portland’s hand dipped ice cream culture AND cocktails in the same building. Less of a crawl and more of a road trip, but there are a number of places worth hitting up on the west side. In the downtown area there are still the steadfast likes of Clear Creak and Bull Run Distilling, each close enough to hit in quick succession. Far out in the depths of Tigard is Indio Spirits, with 11+ products on their menu and one of the older distilleries in the area they are well worth finding. Their flights are small but have larger samples so bring friends and share to get a better idea of the full line. Even further out in yet another unassuming business part you will find Bootleg Botanicals, Big Bottom Distilling, Tualatin Valley Distilling and Vertigo Brewing. Located just off Cornelius Pass Road near Cornell, many are not open for tastings every day. Their out of the way nature means zero foot traffic, so some like Big Bottom are only open on Saturday or by appointment. Be sure to plan accordingly, check schedules and likely call ahead. Knowing how distillers hours run they could forget to open entirely if they aren’t sure anyone is coming. Driving: First and foremost I cannot stress enough the need for a designated driver. Not all of these places are close enough together to walk and given the versatility of Oregon weather you do not want to rely on your feet to get you everywhere. Packages: Second, check out PDX Distillery Row. At $20 it is by far the best value in the city for tasting what the various distilleries have to offer. The passport is good all year which removes some of the immediacy in trying to hit all 7 locations in one day. Dates are important, some of these places are not open 7 days a week. Some aren’t even open 2 days a week so planning for any given day is important. I recommend Saturday as a prime day, most places are open the longest on the weekends. Time, some of these places have only 1 or 2 offerings. Some have over a dozen. The amount of time you and your group can take sampling at any one is going to vary greatly depending on the length of time you spend sipping and how long you spend listening to the patter about the drink itself. In general tasting rooms are going to be open from around 11am to 6pm. It is possible to hit up to 7 locations in one day if you get started early and have an experienced guide, otherwise plan to hit the places that most interest you first on the chance that you will run out of time to do them later. Food. Eat before, and make sure you eat something relatively filling. There are any number of great places to catch lunch before you head out. The Green Dragon on SE 9th has Rogue Brewing’s great selection of sandwhiches, Oven and Shaker does a great Brunch, hunt around it’s a great chance to find some out of the way Portland Food. FOOD! Take a snack break after your first 3-4 stops. You’ve likely just downed the equivalent of 8-9 oz of random shots. Time to take a quick breather and reload before you hit the next couple. Grab some pie, or debris fries. Take a half hour to work some of that stuff and get the better part of the botanicals away from your digestive tract. Storage is important, if you’re taking more than 1-2 people with you be aware that you will buy things. There is too much good stuff for anyone to pass up entirely and after three or four drinks your ability to say no to a good deal somewhat evaporates. Carting an armfull of bottles around with you from shop to shop is a hassle. Be sure your transport has space for everything and is handy for when you buy. Costs: While distilleries are not required to charge for their samples, most do. The only one I’ve encountered that was entirely free was Clear creek. Most others offer a single $5 tasting platter of 4-5 tastes. Some will do $1 single tastes, others like Eastside have deluxe and premium flights that offer higher end offerings. If you’re not doing the distillery row passport expect to spend at least $5 per person per location. You can get this cost waived if you make a purchase in some places but not all. Posted in Feature.Tagged distillery, distillery crawl, feature, food, tours, travel.